Our Portable Solar Charging System can be used as a single power source for maintaining and charging a battery. Setup in less than 5 minutes. The Zamp Solar 40 Watt Portable Solar Charging System features our lightweight 8 Amp solar charge controller mounted on a steel bracket. The Zamp Solar 8 Amp Solar Charge Controller is a 5 stage PWM solar charge controller that’s waterproof and weatherproof. 3 indicator lights show – Faults (any errors) | Charging (solar is charging the battery) | Full (battery is full and solar is maintaining). This 40 watt Portable Solar Charging kit provides 2.3 amps of charging power per hour under optimal sun conditions. Depending on where you live and what time of year will depend on how many hours of optimal sunlight you can expect to receive. Typically we use an average of 6 or 7 hours for the summer and 4 to 5 hours for the winter. Commonly these figures are lower than expected. 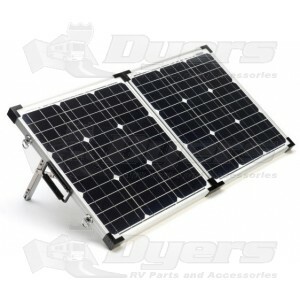 Great for small travel trailers, truck campers, camper vans and single battery systems. Well made, compact, good value for cost.